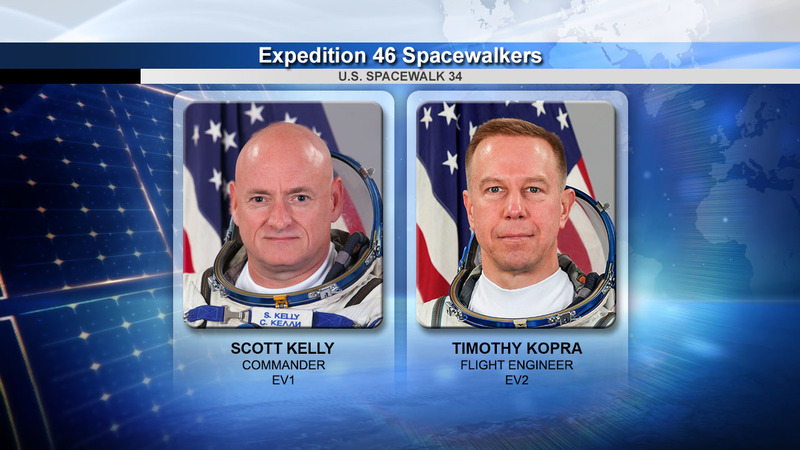 A pair of spacewalkers are cleaning up and reporting back to ground controllers after a short spacewalk Monday morning. 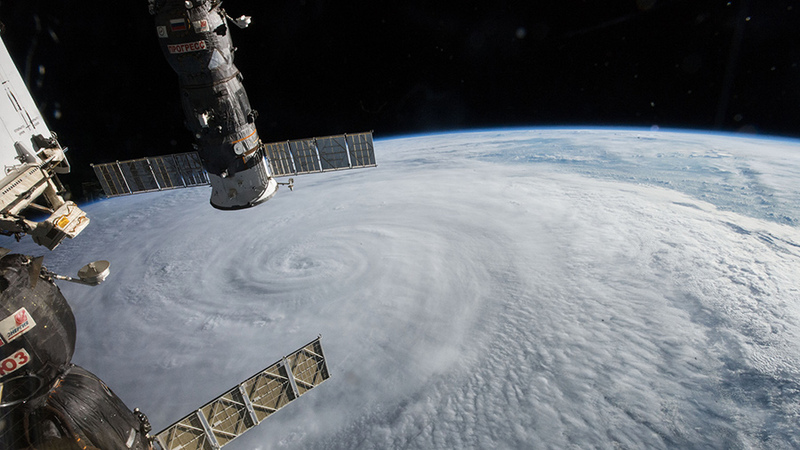 A Christmas delivery is also due at the International Space Station Wednesday at 5:31 a.m. EST/10:31 a.m. UTC. 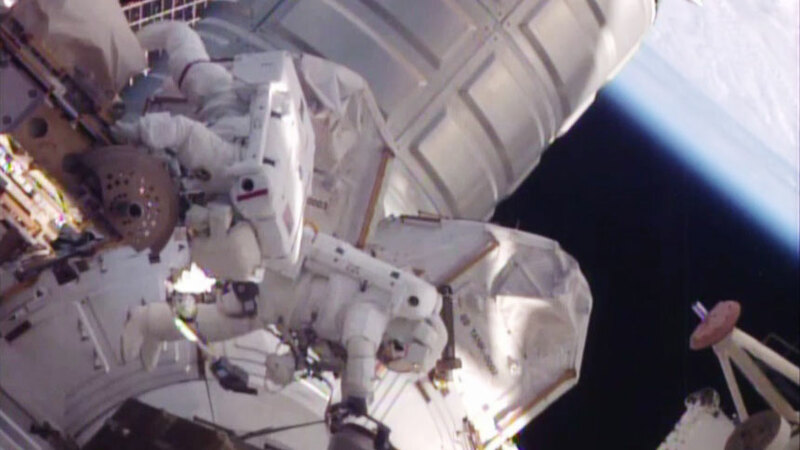 Commander Scott Kelly and Flight Engineer Tim Kopra quickly prepared over the weekend for the spacewalk to release a stalled robotic transporter. 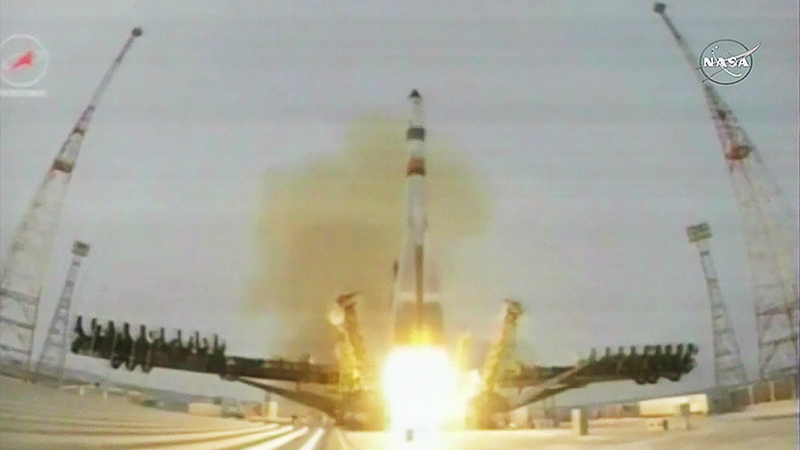 As the pair suited up in the Quest airlock Monday, a Progress 62 (62P) cargo spaceship launched on a two-day trip to deliver 2.8 tons of food, fuel, and supplies for the Expedition 46 crew. The stalled robotic transporter needed to be moved then latched to its worksite ahead of the Progress arrival triggering Monday’s spacewalk. 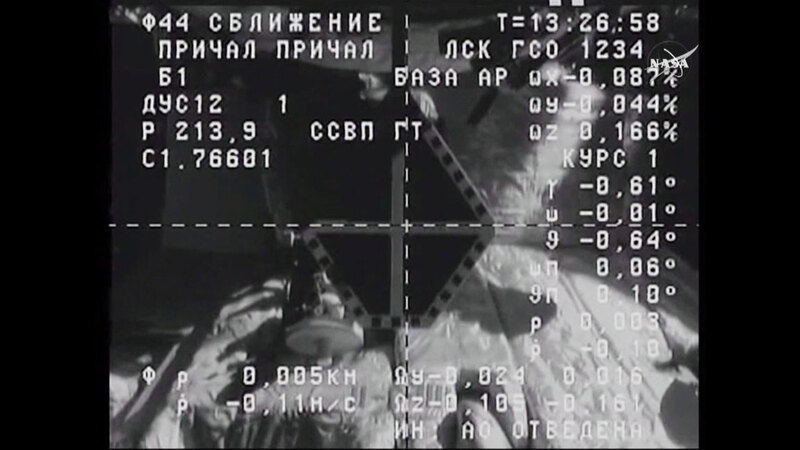 The Progress is a modified design and Russian mission controllers are testing its upgraded software and telemetry systems during its flight to the Pirs docking compartment. Cosmonauts Yuri Malenchenko and Sergey Volkov are preparing for the Progress arrival by testing the TORU tele-robotic rendezvous system. 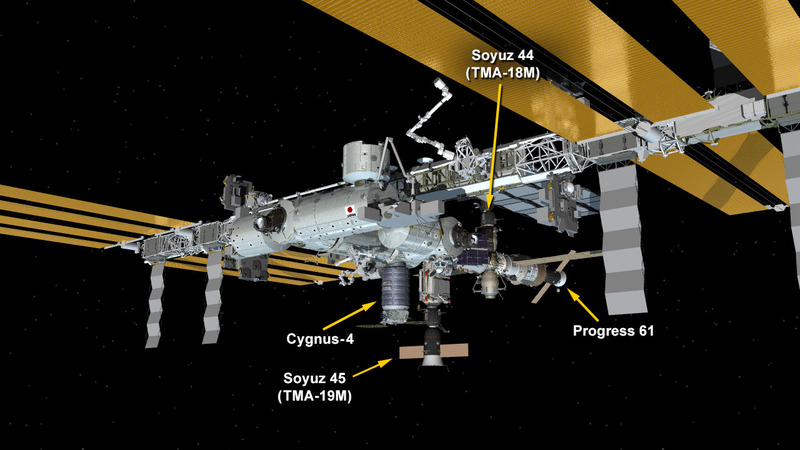 The TORU system would be used in the unlikely event it would be necessary to manually guide the vehicle to a docking. The crew also had time set aside for advanced space science today. The orbiting lab residents explored plant growth and life science as humans learn to live longer and farther in space. Spacewalkers Scott Kelly and Tim Kopra. NASA astronauts Scott Kelly and Tim Kopra switched their spacesuits to battery power at 7:45 a.m. EST, signifying the start of today’s spacewalk, planned for about three hours. Kelly is wearing a spacesuit with red stripes and is designated EV1. His helmet camera displays the number 18. Kopra is wearing a spacesuit with no stripes and is designated EV2. His helmet camera displays the number 17. The astronauts are embarking on the 191st spacewalk in support of space station assembly and maintenance to move the space station’s mobile transporter rail car a few inches from its stalled position so it can be latched in place ahead of Wednesday’s docking of a Russian cargo resupply spacecraft. If the primary task of moving the transporter to its worksite is completed quickly, Kelly and Kopra may press on to a few get-ahead tasks that include the routing of cables in advance of International Docking Adapter installment work to support U.S. commercial crew vehicles, and opening a door housing power distribution system relay boxes just above the worksite to facilitate the future robotic replacement of modular components. The International Space Station Mission Management Team met Sunday and gave its approval to proceed with a spacewalk Monday out of the Quest airlock by Expedition 46 Commander Scott Kelly and Flight Engineer Tim Kopra of NASA to assist in moving the Mobile Transporter rail car a few inches to a worksite on the station’s truss where it can be latched in place and electrically mated to the complex. The green light for the unplanned spacewalk to take place Monday came three days after the Mobile Transporter stalled just four inches away from its embarkation point at worksite 4 near the center of the station’s truss as it began to move to another worksite to support robotic payload operations with its attached Canadarm2 robotic arm and the Special Purpose Dexterous Manipulator (Dextre). Station managers ordered the spacewalk to latch down the transporter as a cautionary measure in advance of the scheduled docking of the new unpiloted ISS Progress 62 cargo ship on Wednesday that will link up to the Pirs Docking Compartment. 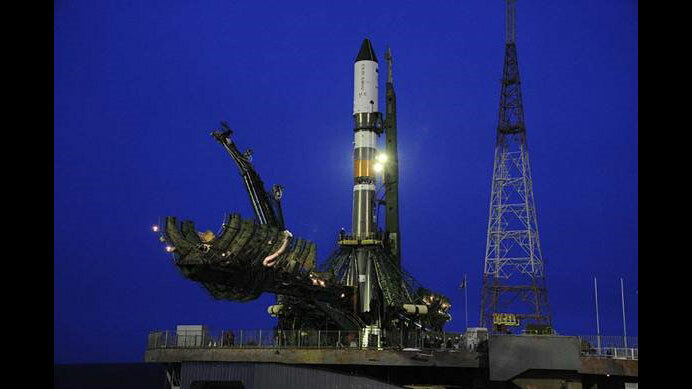 The Progress is on track for launch from the Site 31 launch pad at the Baikonur Cosmodrome in Kazakhstan Monday at 2:44 a.m. Central time (2:44 p.m. Baikonur time). The planned 3 to 3 ½ hour spacewalk is scheduled to begin Monday at 7:10 a.m. Central time. 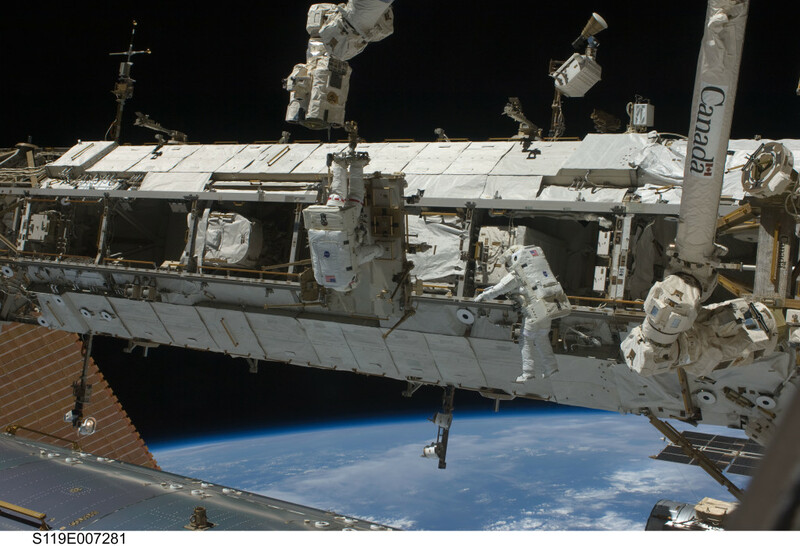 The start time for the spacewalk is variable since Kopra will be conducting a fit check of his U.S. spacesuit in parallel with other spacewalk preparations. NASA TV coverage will begin at 5:30 a.m. Central time. Kelly, who will be making his third spacewalk, will be extravehicular crew member 1 (EV 1) wearing the U.S. spacesuit bearing the red stripes. 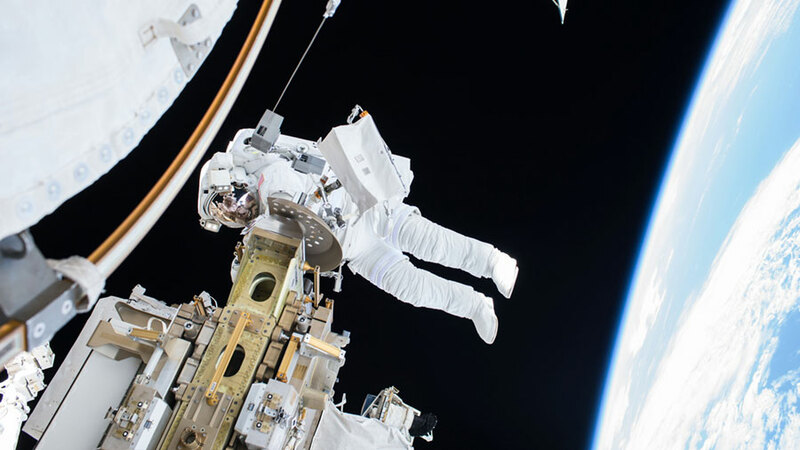 Kopra, who arrived on the station on Dec. 15, will be making the second spacewalk of his career as extravehicular crew member 2 (EV 2) wearing the suit with no stripes. It will be the 191st spacewalk in support of station assembly and maintenance and the seventh spacewalk of the year by station crew members. Kelly and Kopra will float out of the Quest airlock to the area where the Mobile Transporter has stalled to check out the position of its brake handles and other mechanisms to make sure the rail car can be commanded to move back to worksite 4 by robotic flight controllers at Mission Control, Houston. It is suspected that a brake handle on an equipment cart attached to the starboard side of the transporter may have inadvertently engaged, which if correct, should easily be released to allow for the transporter to be moved into place for its latching.